LoopCAD 2014 has been released, which is now available with full Manual J support. LoopCAD now offers residential heating and cooling load calculations, in addition to the radiant and snow melt design features you have come to rely on. The new edition is easy-to-use, powerful and complete, with essential features like AED calculations and graphs, automatic October cooling load analysis, and Manual J-compliant submittal reports. 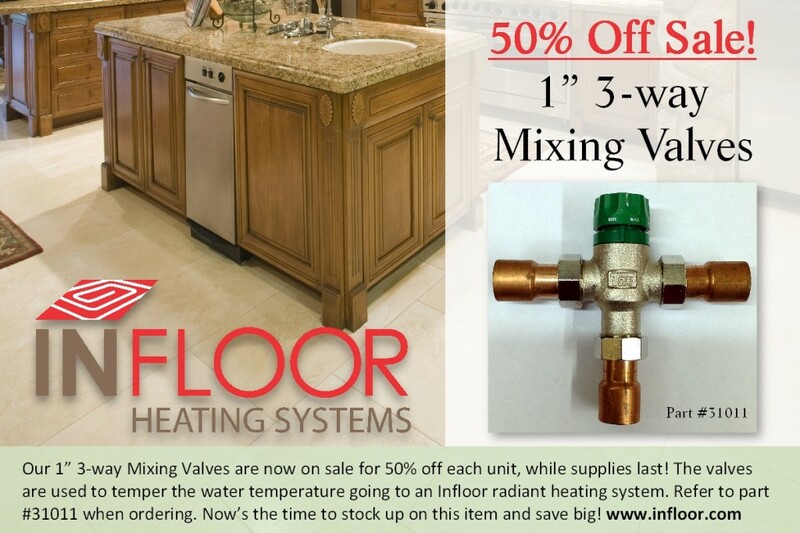 Our 1” 3-way Mixing Valves are now on sale for 50% off each unit, while supplies last! The valves are used to temper the water temperature going to an Infloor radiant heating system. Refer to part #31011 when ordering. Now’s the time to stock up on this item and save big! Contact us today to place your order.